Please be advised that this post may make use of affiliate links, see my disclosure policy for further information, thanks! With Championship weekend over and the Super Bowl teams decided, now is a good time to start thinking about a super bowl party. More often than not this includes things like figuring out decorations and planning a menu. But if you have kids around, you might want to include them in the planning process as well. By organizing a few kid friendly games , your super bowl party can easily become a kid friendly super bowl party. First, let’s talk about those decorations. You could go with an overall football theme by purchasing football balloons and decorating tables with football confetti. Serve food on football shaped trays, football shaped bowls to hold snacks and use football themed dessert plates and drinking cups. Other options include going with a team theme depending on if you’re a fan of the Seattle Seahawks or the New England Patriots. Birthday Express also has plenty of ideas for ready to go Football themed games to play at your party. Or, if you’re like me and wait until the last minute to pick up decorations, you can also check out Amazon for an amazing selection of football themed party decor. I know that with Prime, I’ll have my stuff here in two days guaranteed. So now that we’ve talked about how we’re decorating for this kid friendly super bowl party, let’s talk about some food and activities. One of my favorites as far as games go? Playing bingo. I have created three printable bingo cards (and included one blank for you to edit your own) in a .doc format and in .pdf format. (To save, right click and save as). Normally, I only share the .pdf version but I figured if you have a word processing software program, that this would be easier to edit that way. For us, this year, the only child at home will be Squeaker so I’m not sure as to how much we’ll do for the super bowl. Last year it was pretty low key as I watched more for the game… and then the highly entertaining half time show. This year, however, I have no interest in the half time show… but I will proudly be cheering on the New England Patriots. What ideas do you have for hosting a kid friendly super bowl party? I never thought about having a kids super bowl party. Thanks for the idea. I might have to try that sometime. A lot of great tips. Thanks for these great ideas! The Lego Super Bowl is genius. As a kid I remember being super bored at superbowl parties. With these, my kids won’t have to experience that. Great ideas I can try at our Super Bowl party next month! These are some great ideas! It’ll be fun to put together the whole party when it comes to the super bowl! Can’t wait to hear how it went! This is great hosting a kid party. I’ll make it to my two kids well, I really love this post for sharing great ideas. I have to say, I am really hoping to host a superbowl party this year. Love some of these great ideas. I’ll be going to the different blogs to see what appeals to me. I’ll be hosting Superbowl night too! Hmm gonna pick up some ideas from this post! 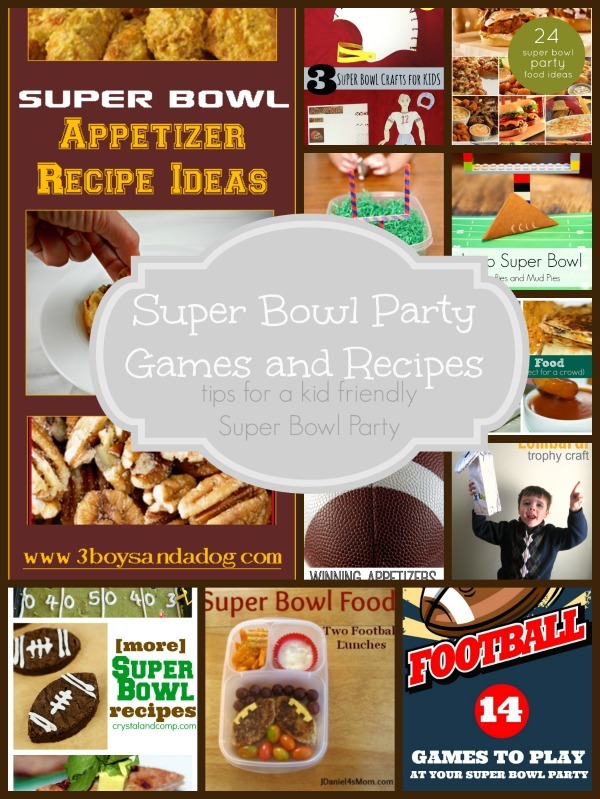 These are great ideas for a kid friendly super bowl party. I like the idea of the Super bowl math activities and as well as Super bowl crafts for the kids. These would be fun for the kids. Thanks for sharing. The kids wanna be a part of the SuperBowl parties too! I know my own is such a picky eater so it’s a great idea to have some “kid friendly” super bowl snacks for them. This is such a great post! I think you hit on everything, and I can’t wait to see your super bowl party pics! These are great super bowl party ideas. We have Hockey parties at our house. My family does a big Super Bowl party every year, and it never crossed my mind to include kid friendly activities. What a great idea! The last 5 or 6 kids in our family have all been boys who were happy to sit and watch the game with everyone else. Definitely keeping these in mind for the new generation of littles in our fam. Our friends all have kids so a kid friendly party is always happening. He has this one set of friends that have 2 small boys and they are always hosting some sort of get together at their house. Kids just play, adults play games or watch movies and there is always good food. Hurray for your tips on making it fun for the kiddies too! Love all of it! Thanks so much for sharing. Need to try them out! This hosting a kid party is great! Looks all kids had fun! and very great idea for those who planning a party. These are really great ideas for the kiddos. I will have to make some of these. I hadn’t thought of a super bowl party for kids. I LOVE the idea! Super cute ideas!! These are some great activities for the kiddos. We’re going to have a family party with tons of kids so this perfect– thanks! Omg these are all such awesome ideas for the superbowl. I’m Gunna have to bookmark this and come back to it when I do my superbowl planning this week! Oh wow now this is just way too cool – a kid’s super bowl party? That’s just too awesome haha! My kids are always with me when we go to the parties or when we have one here. I do try to find something new for them to do when there are there. Some great ideas to have a kid friendly party. Kids should get to enjoy the day also.